The Bund (also called Waitan [外滩]; pronounced like”fund”) is an area of Huangpu District in Shanghai which runs along the west bank of the Huangpu River. With a length of just over a mile (1,700 meters), the Bund extends from Waibaidu Bridge (“Garden Bridge” in English) in the north to East-2 Zhongshan Road in the south, and is a world-famous destination and landmark. The Bund , or “Embankment,” usually refers to the building and wharves on this section of road. Facing the Huangpu River, the Bund houses 52 buildings of various architectural styles including Gothic, Romanesque, Renaissance, Neo-Classical and Art Deco such that it is nicknamed the world expo of architecture. Before 1842, the Bund was a desolate area, a narrow muddy path to the river, without any protective facilities along the bank. According to the Treaty of Nanjing which was signed after the First Opium War (1839 – 1942) with Britain, Shanghai was forced to open up as a port for Britain and other Western nations and the Bund began its development of banks and trading houses. In November of 1843, a British captain was sent to Shanghai and he asked for a piece of land on the bank of Huangpu River for the British to settle on. Later, French and American settlements were developed. Since then, the Bund gradually came into being. At the end of 19th century and beginning of 20th century, a building boom led to Shanghai becoming a financial hub of East Asia, which helped Shanghai step into its modern times. By the 1940s, many buildings in the Bund served as the headquarters of financial institutions running across China. After the founding of the People’s Republic of China in 1949, these institutions were moved out and buildings were converted to other uses. The Bund underwent renovations in the 1990s. A great change took place in Shanghai after a visit by Deng Xiaoping, Mao’s successor as leader of the PRC, in 1992. In the next year, the plan for renewal and renovation of the Bund was finalized and the Bund resumed its role as a financial center. Chen Yi Square is a famous spot on the Bund. The only bronze statue of Chen Yi (the first communist mayor of Shanghai) can be found standing on the square. On weekends, you can often see concerts that are held in the front of the statue of Chen Yi. A pedestrian transit tunnel between East Nanjing Road and Oriental Pearl TV Tower crosses the Huangpu River. It only takes about 2.5 to 5 minutes to reach the other bank of the river. The spare space in the tunnel is also fully used to demonstrate various kinds of pictures related to the history, culture, technology and scenery of Shanghai. The main thoroughfare running alongside the Bund is called Zhongshan Dong Yi Lu and on its western side are strewn many colonial-style edifices such as the former British Consulate, the former Hong Kong and Shanghai Bank, the Peace Hotel, the former Shanghai Club (which is now the Waldorf Astoria Hotel), and the Customs House. There stands a large granite obelisk, the Monument to the People’s Heroes, on the shore of the river which was built in 1993 which was dedicated to those Chinese loyal to the Party since the 1840s. The Bund History Museum (open 9:00 – 16:15; no admission fee) sits at the very base of the Bund contains artifacts and photographs of the district. Further down Zhongshan Dong Yi Lu you can find some restaurants, street vendors, and some amazing views of the river. Where the street intersects with Yan’an Dong Lu, Signal Tower is an impressive sight: an tall, round, brick structure which was the control tower overseeing river traffic during the colonial era when it was built in 1884. Book the trip of a lifetime with China Tour! 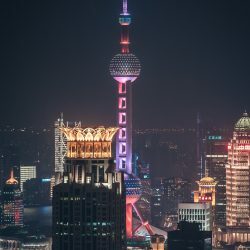 If you’re thinking about taking a trip to Shanghai or anywhere else in China, make sure you book with the China travel experts at China Tour. We offer a wide range of affordable packages including exciting guided tours conducted in English which you can take a look at here. If you have questions or you’re ready to book your next adventure, just fill out a form or give us a call: (888) 878-1777!